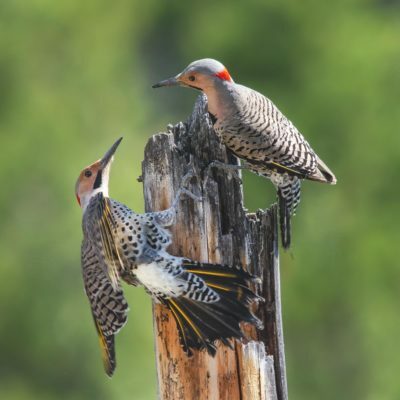 Northern Flickers. Photo by Keith Williams. Birds are fascinating to observe and a joy to watch. They introduce color, striking patterns, and music to our daily lives. Their migrations and nesting cycles mark the changes in season and connect us to nature. Birding is a fun and challenging hobby that you can do anywhere, from your backyard to your local parks to your next vacation. It is a superb way to enjoy the outdoors. 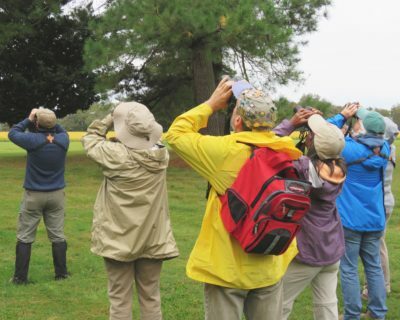 Virginia is a premier location to go birding with 400 species to observe. Virginia’s rich diversity of habitats offers the opportunity to see coastal birds along the Atlantic Ocean, grassland species in the Piedmont, and forest species in the Blue Ridge Mountains. In addition, its mid-Atlantic location provides an opportunity to see northeastern and southeastern-ranging bird species all in one state. Each spring and fall, migratory birds traveling the Atlantic Flyway pass through the Commonwealth, providing opportunity to witness warblers, raptors, and shorebirds as they stopover in Virginia to rest and refuel. In the winter, Virginia’s relatively mild climate provides a refuge for northern breeding birds, including a wide diversity of waterfowl, seabirds, and some songbirds. Wherever and whenever you go birding in Virginia, there is always a world of birds to discover. Consider buying binoculars to enjoy close-up looks at birds from a distance. The standard binocular size for birding is an 8 × 42 (8 power magnification and 42 mm diameter objective lens). This size provides desirable qualities in binoculars for birding, such as a strong magnification with a bright image and a wide field-of-view. 10-power magnification would be the highest magnification recommended for birding, which will enable closer looks of birds than an 8-power, but as you increase the magnification, binoculars can be difficult to hold steady and the image may appear “shaky.” Adding a harness or a padded neck strap will make them more comfortable to carry. For younger children (12 and under), smaller hands and smaller faces will do better with a smaller scale binocular. 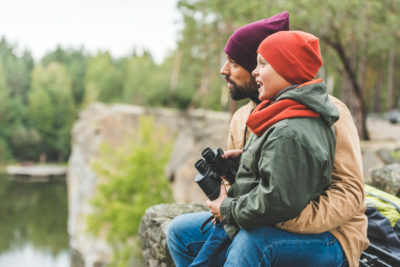 Compact models of adult binoculars (also called pocket size) are a good option for kids because they will be easier to hold and the eyepieces are more likely to match the distance between their eyes. Strive to find a binocular in the 6–8 power magnification range. It is important that the binoculars be lightweight and easy to hold, so that children can hold them steady. Be wary of toy binoculars, as they generally do not provide much magnification power and are typically too low in quality to serve any real function. Additional factors to consider for children are durability, a brighter color (easier to spot, if set down), and a harness or comfortable neck strap, so they are easy for kids to carry and less likely to be set down or lost. 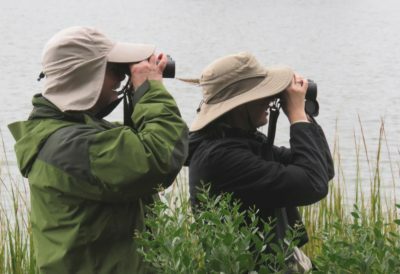 If you are not yet ready to invest in your own binoculars, sometimes you can borrow them from parks, refuges, and preserves that have a nature or visitor center. It is worth it to stop in at these centers and ask if they have binoculars available for loan while you are on-site exploring their trails. Adjust the eyepiece cups. If you are not wearing glasses, raise the cups up. If you are wearing glasses, keep the cups down. Adjust the distance between the two barrels to match the distance between your eyes. When you look through the binoculars, you should see just one perfect circle. To focus the binoculars, roll the central focus knob, typically located between the eyepieces, until the object you wish to see looks clear and sharp. For a finer focus, look at an object with your binoculars, then close your right eye, so that you are only looking with your left eye. Turn the focus wheel until the image is clear. Then, still looking at the same object, close your left eye and open your right eye. Turn the diopter adjustment (a ring typically located on the right eyepiece) until you see a sharp focus with your right eye. Then open both eyes to see a clear image. When you go birding, first find a bird with your “naked eye,” and then keeping your eyes on the bird, raise your binoculars up to your eyes to get a close up look. This technique can take a bit of practice at first, but it is much easier to find birds when you have use of your full peripheral vision. Focus on finding the bird first, then using your binoculars to get a better look. Get a field guide to identify the bird species you see. Field guides on birds are available as books, apps, and websites. There are many good guidebooks from which to choose. Selecting a guide that focuses on your region will provide more efficient identification and portability. Be sure that the book you select shows range maps and detailed illustrations or photos. Recommended websites: The Cornell Lab of Ornithology’s All About Birds and Audubon’s Guide to North American Birds. Recommended apps: Merlin Bird ID App, by the Cornell Lab of Ornithology and The Audubon Bird Guide App, by Audubon. To get started, use your guidebook to familiarize yourself with the different families of birds. Don’t forget these key items for spending time in the outdoors: water, sunscreen, a hat, and bug spray! White-breasted Nuthatch at Feeder. Photo By Courtney Celley/USFWS. Start off by birding from your balcony, in your yard, and around your neighborhood. Keep a pair of binoculars and a field guide handy by your window, so you can get close up looks of the birds and try to identify the different species you see. You will be able to start identifying birds, if you carefully observe the following. Body size, shape, and special features: Is it tiny like a hummingbird, large like a goose or somewhere in between like the size of a sparrow, robin or a crow? Is it squat and stocky or tall and thin? Does it have a long tail or a short tail? What shape and size is its beak? Does it have a rounded head or a tall crest like a Northern Cardinal? Colors and patterns (also known as field marks): What colors do you see? Where on the bird’s body is each color? Are there any markings that stand out, such as stripes or spots? Behavior: What is it doing? How does it move? Is it alone or in a flock? What is it eating? Habitat: Where did you see it? What kind of environment? A key part of birding is listening. Birds are often easier to hear than see. Listen for their rustles, songs and calls, and then hone in on the source of the sound and look for movement. Many people use words and phrases as mnemonics to remember bird songs and calls. For example, the American Robin’s song is often described as sounding like, “cheerily, cheer up, cheer up, cheerily, cheer up.” You can find descriptions of bird songs along with mnemonics in most field guides. Websites and apps typically have recordings of bird song to listen and study. You can also purchase albums of bird songs. Do not get discouraged—birding by ear is a skill that takes years of practice to develop! Over time, the more you bird and the more you study bird song, you will recognize more and more species by their songs and calls. The Virginia Bird & Wildlife Trail (VBWT) makes it easy to find places to go birding with over 600 viewing sites throughout the Commonwealth. Visit the website to find a viewing site near you or to plan a birding vacation. The more places you go out and explore, the more bird species you will discover. Print out this checklist of Virginia birds to keep track of all the Virginia species you’ve seen. Wear weather-appropriate clothing and comfortable walking shoes. Wear neutral colors. You will have a better chance of seeing birds and other wildlife if you blend in with your surroundings. The best time to see most birds is in the early morning when they are highly active and feeding. Mid-day is a quieter time when most species are resting. Late afternoon, just before dusk can also be good, as many bird species will resume activity and feeding. Birding with others adds to the enjoyment. 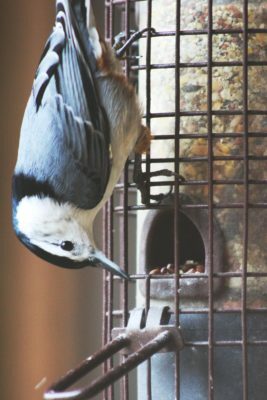 Find your local bird club at these websites: Virginia Society of Ornithology and Audubon. 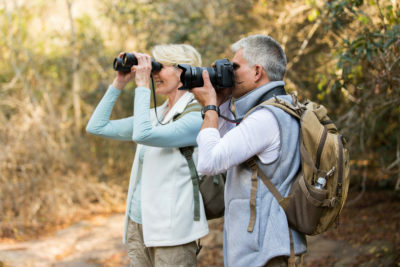 Joining a bird club is a great way to meet other people who enjoy bird watching and you will have the opportunity to join the club on birding field trips. Not only will this enrich your birding experience, but also it will help you to become a better birder. Check with your local parks, refuges, preserves, and nature centers to see if they have any guided bird walks coming up. Refrain from approaching birds. Always maintain a respectful, safe distance and do not interfere with their activities. Follow the Wildlife Watcher’s Creed. Many birders record their bird observations and keep a “life list” of all the bird species they have seen. An easy way to record your observations and start your life list is by using eBird, through either its website or its easy-to-use app. When you record bird observations on eBird, they become part of a citizen-science database. Other birders and scientists around the world use this database to understand bird distribution, abundance, habitat use, and trends. eBird is just one way that birders can contribute to bird conservation.